In a press conference today Max Anderson, the new director at the Dallas Museum of Art (DMA) announced an agreement with Turkey to return this 2nd Century AD Roman Mosaic, and other objects. The mosaic was acquired in 1999 at a public auction at Christie’s in 1999 for $85,000. According to the DMA, after noting on Turkey’s cultural heritage ministry website that there had been an Orpheus mosaic missing, Anderson contacted Turkish officials. He was given photographic evidence showing the and comparing the mosaic with a border, being removed by looters near ancient Edessa, modern Sanliurfa in Southern Turkey. In announcing the return, Anderson also announced a new initiative called ‘DMX‘ which attempts to seek loans and exchange agreements. A move that if successful would position the museum to pioneer the ideals of a universal museum while also respecting the laws and restrictions placed on objects by their nation of origin. 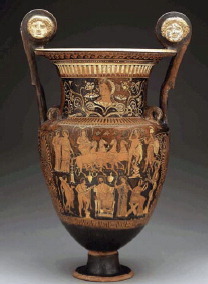 and a calyx krater, dating from the 4th century B.C.E. You are immediately equated with a criminal nowadays by being a collector. You have in Italy hundreds of thousands of people that have antiquities at home. They might have inherited them or bought them. In my youth, there were flea markets, and you could buy every antiquity you wanted. All those people that bought things – are they all criminals? It’s like Prohibition in the United States – there’s a criminal underworld. Italian law leads to crime. By legalizing the market in antiquities, you destroy the black market and eliminate the incentive to make forgeries. He has been investigated by the public prosecutor in Rome since 2006, and his New York apartment has also been searched by U.S. Customs officials. Chasing Aphrodite points out that the returned material has ties to the usual suspects: Gianfranco Becchina, Robin Symes, and Giacomo Medici. And also notes other museums have similar objects. Given Turkey’s increasingly muscular calls for repatriation, the DMA has positioned itself to create favorable agreements with foreign nations, and also set itself apart from other institutions with similar material with insufficient histories. When I see these objects at a museum, with a scant or nonexistant provenance listed, I assume it must be looted. Forward-thinking museums are increasingly doing the same. And despite what value there may be in viewing the object in a ‘universal’ museum, that probable criminal history increasingly renders the display of these objects unjust. Michael Granberry, Dallas Museum of Art returns rare work of Roman art, signs memorandum of understanding with Turkish government for international exchange Center Stage, Dallas News (Dec 3, 2012).